Read the funny story of two inquisitive kids, Ty and Karlie, and build simple, non-motorized models of the robots they construct and fix during their adventure to an automated candy factory. During this zany outing, Ty and Karlie build various robots to perform tasks and solve problems in the factory. The robots have moving parts, wheels, and gears, so kids can learn firsthand about simple machines and gear trains. As you follow the story, you can build models of the ten robots featured in the story. 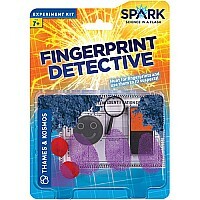 Large, colorful plastic building pieces make it easy for small hands to put the models together. In the story, the kids build robots with arms that rotate, turn, and spin. They fix a robotic arm and other specialized robots that complete specific tasks inside the factory. They construct a robotic drone that flies through the factory to coat the candies in sprinkles, wheeled robots that zoom across the factory floor, a taffy-pulling robot, and a funny gum-kneading robot. From each humorous segment of their silly adventure, the kids learn something new about robots and machines. 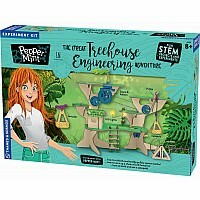 This 53-piece science kit combined with the beautifully illustrated storybook provides an engaging way to teach simple engineering concepts to preschool-age kids. Start laying the groundwork for strong STEM related skills and comprehension. This kit helps develop fine motor skills, science and math skills, visual-spatial skills, and reasoning and concept development skills. Measures approximately: 14.70 x 9.40 x 6.30 inches..